After a good series launch with Weiss, Mark Knight & Adrian Hour, Toolroom is proud to present the next installment in its signature ‘Toolroom Live’ series. Taking the helm this time around for ’Toolroom Live’ are Eelke Kleijn, Prok & Fitch and Boris. Talented producers in their own right, each artist brings their signature sound to the mix, creating a balance of depth, enchanting moments, and straight up dance floor biggies. Dutch master of melody Eelke Kleijn was tasked with showcasing the deeper side of Toolroom, and the results are pretty good. 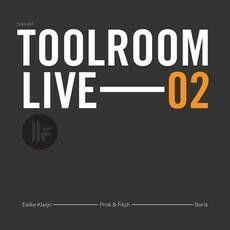 Prok & Fitch have long been members of the Toolroom family, and were an obvious choice to help spearhead the label’s second Live endeavour. The finishing touch of the trifecta, Boris steps up to take care of mixing duties on the final disc.